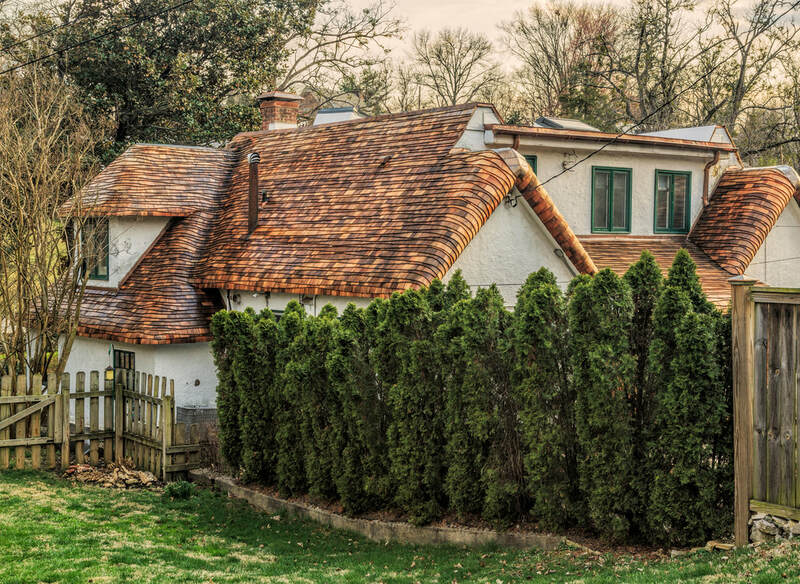 Roofing Artisans' Storybook Home roof project in the Upper Highlands neighborhood of Louisville, Kentucky. Mild and heavy wave-coursing was used throughout this project. For this project, we installed 18-inch Old Growth Red Cedar wood-shingles from Vancouver, BC. All material was steam-bent on site and hand-cut on-site to ensure a truly custom fit. Expert representation and valuation services were provided by Roofing Artisans for this project. Storybook roofs are complicated and labor-intensive installations. Homeowners of these artful roofs need an expert who understands the true value of these special roofs. Please call or email us if you have an insurance claim on one of these wonderful structures. Storybook Home complimented by Roofing Artisans' custom roof installation.